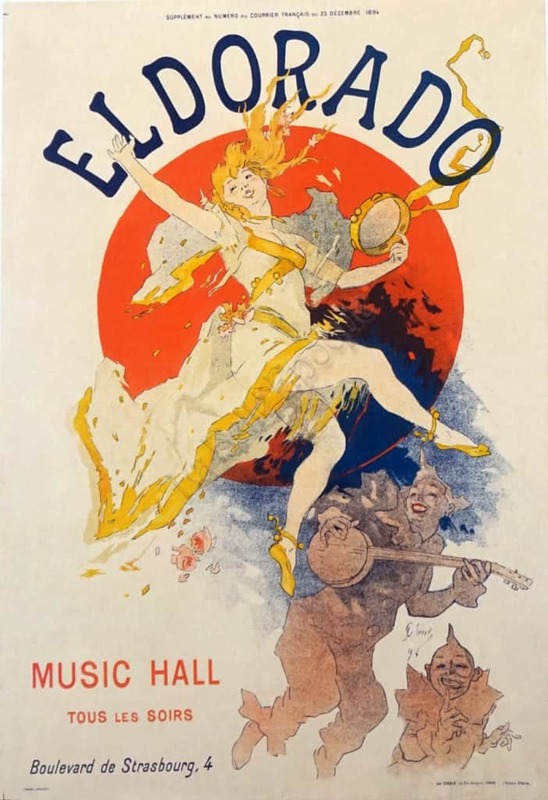 This is a rare French Belle Epoque period advertising poster for Eldorado Music Hall created by Jules Cheret in 1894. This poster was created as a supplement for the Courrier Francais on December 23, 1894. Like many of Cheret’s works, the focal point of this image is a beautiful, cheerful, and carefree woman, an archetype that came to be referred to as a “Cherette.” This Cherette dances in the center foreground of the poster, beautifully dressed, holding a tambourine. She is framed by a bright red circle which allows the yellow of her dress and hair to pop out from the center of the poster. Above her, curving around the red it says, “Eldorado,” and below her are sketches of playful characters playing an instrument and making a silly face. This poster has all of the hallmarks of a Chéret masterpiece: bright lively colors, dynamic lines, and a dominant sense of gaiety and vitality. This poster was a supplement au numero du courrier francais du 23 Decembre 1894 (encres lorilleux) and printed by Imp. Chaix 20 Rue Bergere. Paris (Ateliers Cheret).